Always looking to respond immediately to their customers’ needs, it’s really important for the British Gas business marketing team to have the ability to quickly edit online content. 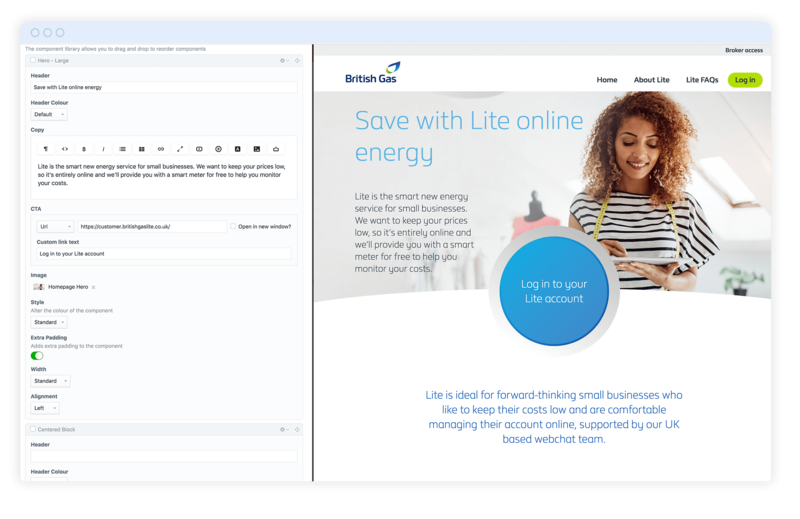 So what to do when the British Gas Lite website wasn’t editable, having been first launched in the days before Content Management Systems? It’s a situation that often arises thanks to the relentless march of new technology, but one that’s also easily resolvable. Adding smart CMS-integrated components to the Lite website proved to be simple, but highly effective solution. Before re-engineering the website, the project team’s first task was to identify the CMS that would be appropriate to a brand as well established as British Gas. Scalability and robustness were key factors. For a more in depth look at CMS', read Zak's post on choosing a CMS. There are three constants in life; death, taxes, and businesses outgrowing their technology. To resolve the editability issue, the Lite website was migrated to Craft CMS. Following this, a field layout was developed to allow the British Gas marketing team to efficiently create and update all web content from an intuitive User Interface, locked behind a secure administrators Control Panel. We made full use of our Component-based Design principle as explained here. Each block of content was separated from their original monolithic templates, and rebuilt into reusable, and repurposable components. Full integrations were made to third-party tooling (analytical, data capture, tag management), as well as new features that will hot up their websites capability (Built-in SEO management, Form builders, Redirect System). Deployment was achieved as a collaborative effort. Tribe and British Gas' technical team joined forces to release the site in a seamless manner, with SSL security as standard. Absolute minimum downtime was achieved - critical for such a high-traffic website. Hours of research went into selecting a hosting provider, one that was established, secure, and reliable. Shouts out to FortRabbit. And the results are excellent. The British Gas marketing team now has the means to fully realise the potential of dynamic content, and to harness the power of website customisability, without compromising the British Gas brand identity. You can see this project in action at britishgaslite.co.uk.